The Super City is five years old this month. 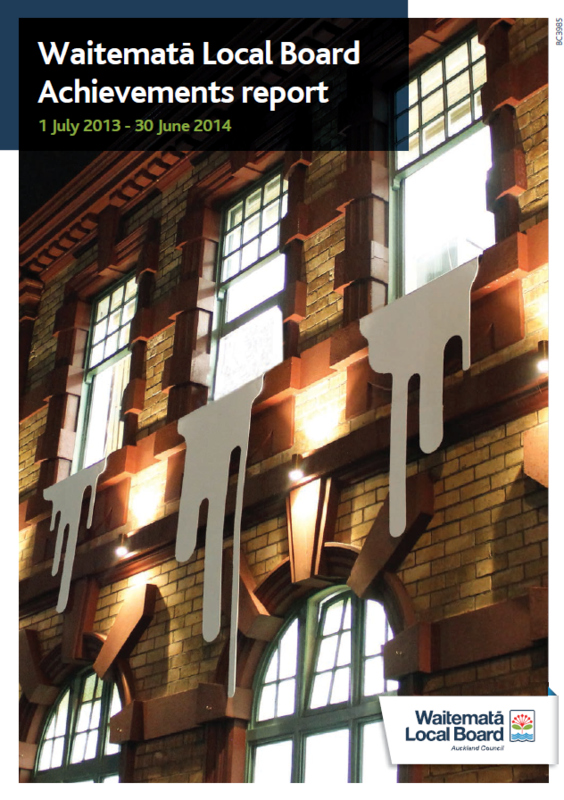 It also heralds the first five years of your local Waitematā Local Board and the honour I have had in chairing it. 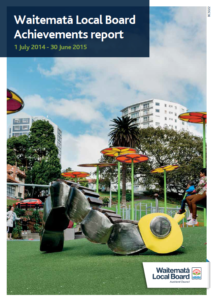 Auckland Council remains a large beast. Representing one in three New Zealanders, Rodney Hide’s experiment in bringing together the six legacy Councils and one regional council remains a work-in-progress even after five years. Led by an executive mayor, who history will remember well, but whose mayoralty has nearly run its course, Len Brown continues to dominate the all-important budget and rates setting and controls the debate through appointing his deputy and committee chairs. 20 Councillors make up the governing body that spends its days in interminable open and closed meetings considering regional policies, and making the big picture decisions. Waitemata and Gulf Islands ward has its back covered and has been well served by its experienced councillor Mike Lee. However, a Governing Body that passes its 10-year budget by one vote, as occurred this year, is a body that has some work to do to gain control of an organisation to give us confidence local democracy is alive and healthy. 21 local boards bring local decision making, and remain the democracy contact point for most residents and ratepayers. Still considered, and often called, community boards, even by many within Council, their potential remains yet to be fully tapped. Rounding out the Council family are the elusive Council Controlled Organisations, including the huge Auckland Transport. Much of your elected members’ time is spent interacting and responding to these unelected bodies run by independent directors and on paper it shouldn’t work. But somehow it does – most of the time. Auckland Transport still have much to learn, with consultation duds such as the Grey Lynn shops bus changes, amongst other examples. 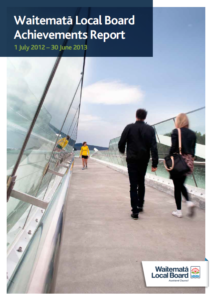 Auckland continues to improve daily – we only need to look around our city and try to remember five years ago, before the last Rubgy world cup, Wynyard Quarter existed, or the CRL was a project, to know this is so. Much has also been achieved at Local Board level in five years. 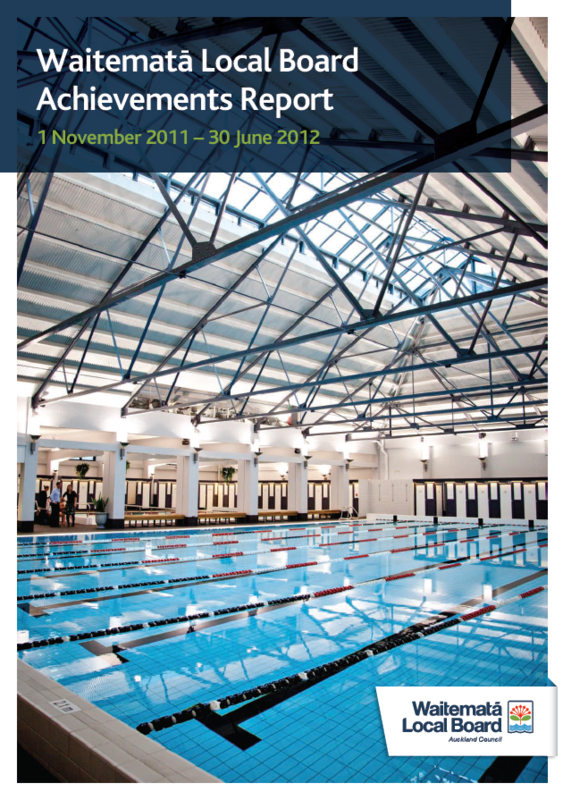 Despite getting used to new shared governance our first year 2010-2011, saw early progress. 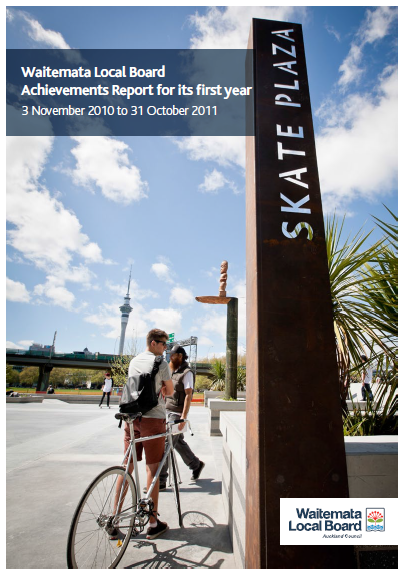 Local highlights were the completion of the destination skatepark in Victoria Park, and the return of the replica three lamps to Ponsonby. That year the board made an official commitment to support Fair Trade. 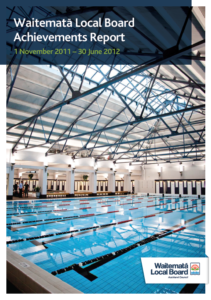 In 2011–2012 the board oversaw the completion of the Tepid Baths restoration, the refurbishment of Victoria Park’s Campbell Free Kindergarten, the Judges Bay upgrade, and a major commitment to upgrade of the long neglected Symonds Street Cemetery, now evident. We declared all Waitematā sportsfields and playgrounds smokefree and initiated a long-term project to make our coastal areas more publicly accessible with the Weona-Westmere Coastal Walkway, now under construction. 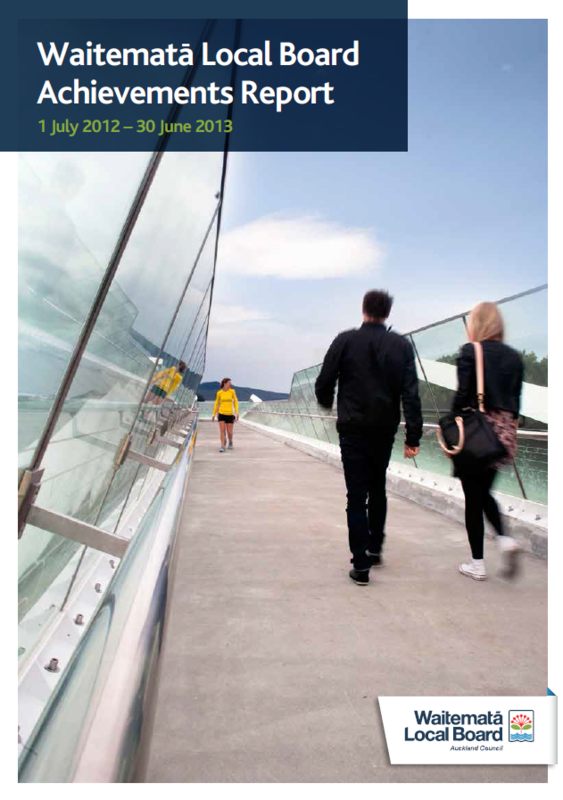 The installation of an award-winning Pt Resolution bridge (International designers Architecture Award) was certainly a highlight for 2012–2013 as was the nearby Judges Bay upgrade reinvigorating the area. 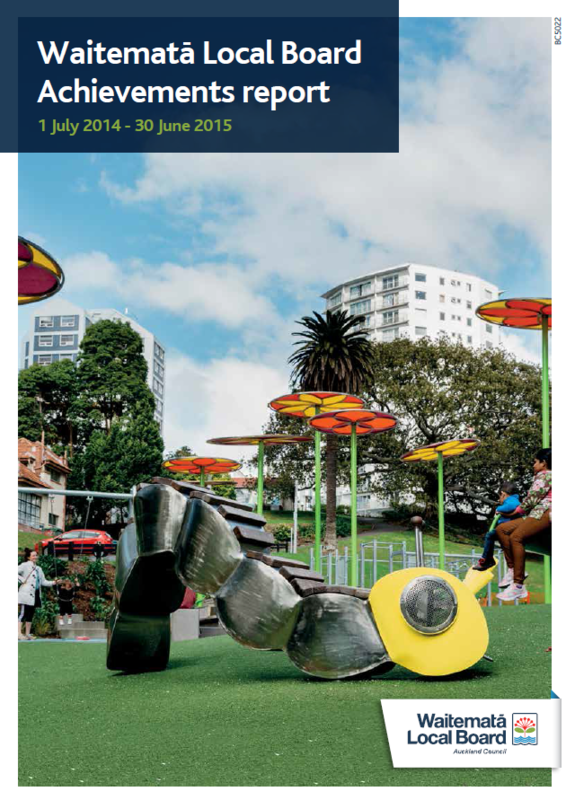 A longer-term investment of note was starting our roll-out of public water fountains throughout Waitematā parks. 2013–2014 will forever be remembered as ‘the year of plans’. 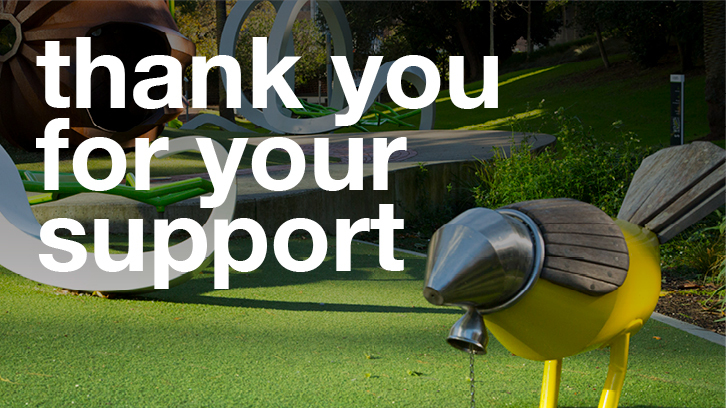 We seemed to be forever discussing various plans with the community, and thank you. We are proud though that development plans have been completed for Symonds Street Cemetery, Myers Park, Pt Resolution Taurarua Reserve, Western Park, Grey Lynn Park, Ponsonby Road, K Road and Newmarket’s Laneways. These now guide short and future longer term development. Another large project was the refurbishment of Studio One Toi Tū in Ponsonby, providing an accessible community art space for all. The year just been (2014–2015) was another busy one. We saw Stage 1 of the Myers redevelopment come to fruition with the opening of an award winning children’s playground (top honours Resene Total Colour Awards). 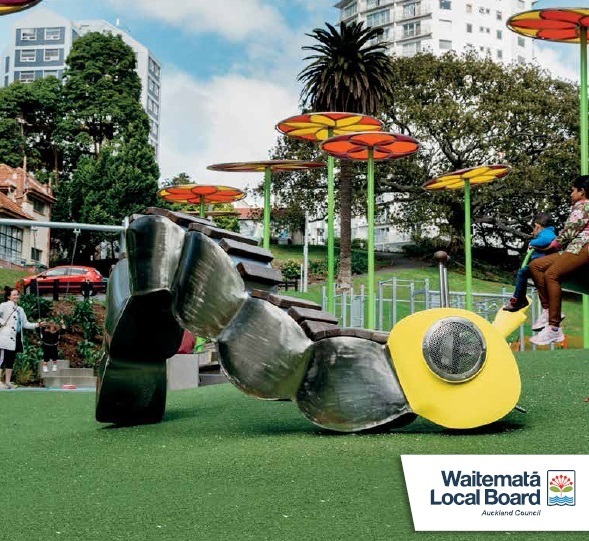 Waitematā was the first local board registered as ‘child friendly’ through the international UNICEF Child Friendly City accreditation process and we celebrated 100 years of Tepid Baths, Parnell Baths and Myers Park. In this selection of highlights, we must mention our advocacy work helping save the six Great North Road heritage Pohutukawa trees, and the transformation of thinking about cycling in Auckland. We are part of Auckland Council, but our primary role is as elected representatives of our local communities to speak on your behalf. We hope you will agree we have made a good start. We think so. 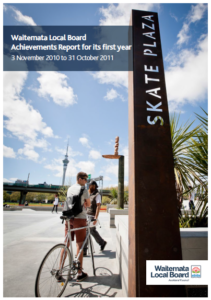 Copies of all five annual Waitematā Local Board Achievements Reports can be found on the Council website and links on our Facebook page.